It’s a little before 7:30 in the morning, and as you approach a local GVEC office on your way to work, you notice the fleet of red trucks exiting the yard. Just a few hours earlier, thunder and lightning woke you from your peaceful slumber. You noticed the power was out. Without lifting your head, you grabbed your phone from the nightstand, tapped on the SmartHub® app and reported your outage. You fell back to sleep and woke to working lights, coffeemaker and hairdryer. You are especially grateful for those GVEC linemen this morning. They got the job done; they turned the lights back on. Have you ever wondered who those special people are, braving the storms and keeping the lights on? 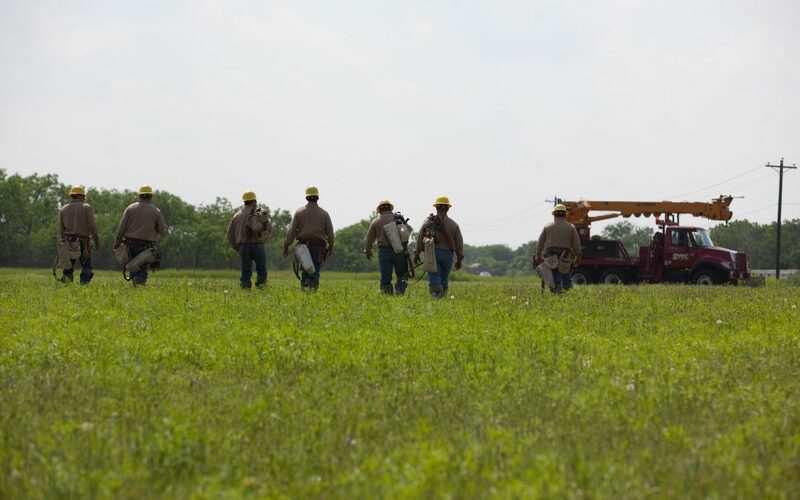 Have you ever wondered what it takes to become a lineman? As GVEC celebrates National Lineman Appreciation Day this month, we thought we’d give you a little insight to how our linemen become, well, linemen. It’s no small feat. GVEC has hired many apprentice linemen straight out of high school. While a high school diploma is enough to land the job, 8,000 hours of on-the-job training are required over the next four years. Of those, 730 are classroom hours, offered through Texas Electric Cooperatives (TEC) or Texas A&M Engineering Extension Service (TEEX). There is also field learning which includes pole climbing, laying underground line, bucket truck and digger schools. Through GVEC’s apprenticeship program, a lineman must pass a two-part test to move to the subsequent job level each year. The first part of the test is in the field, which must be passed before being allowed to take the written exam, on which an 80% or above must be scored. Once a GVEC 4th year apprentice lineman tests out, he has officially earned the title Lineman. 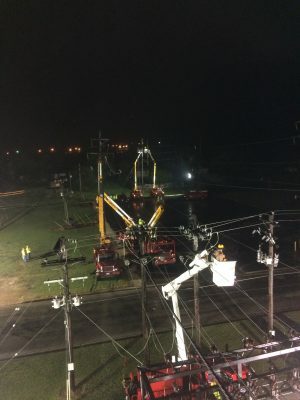 This lineman continues to work and participate in safety and industry-specific training for another five years before he is designated as a journeyman. Additionally, GVEC’s lineman training program is tailored to our specific standards of operation. For example, quarterly trainings that are more detailed than customary TEC instruction are hosted for our linemen, according to Executive Manager of Operations Richard McKinney, who oversees all GVEC’s line departments. God said, “I need someone willing to leave his bed in the silent darkness of night; kiss his wife and kids goodbye; climb a pole in the middle of a storm; stay mindful of the safety of his brothers, as well as his own; push his mind and body to limits he can’t fully explain; and able to harness strength, knowledge and bravery, along with thousands of volts of electricity, keeping the lights on for his fellow man.” So God made a lineman. McKinney was 19 years old when he became a lineman in 1984 at DeWitt Electric Cooperative, which later became part of GVEC. His favorite part of being a lineman was climbing poles and doing pole work. When asked what has changed since his rookie days, he says there are more detailed safety practices. Also, the accountability linemen take looking out for each other has definitely increased. “It’s like Todd Craven (GVEC safety/loss control coordinator) always stresses—you are your brother’s keeper,” said McKinney.